Do you feel like your organization has exhausted its fundraising opportunities? Does making your ever increasing budget feel like getting blood from a stone? Has your organization considered peer-to-peer (P2P) fundraising as a way to expand your donor pool and your bottom line? Read on for a P2P primer and how to get started in P2P! At its core, P2P fundraising allows organizations to tap into their supporters’ networks of family, friends, and coworkers. Without P2P, an organization’s donations are generally limited to their existing constituency and those who they can reach through various marketing methods. Through P2P fundraising, organizations greatly expand their universe of donors, while empowering their supporters to contribute more to causes they are passionate about. Even better, your supporters make better fundraisers than your staff because their donation asks are more likely to result in a donation. Your organization needs to ask hundreds or perhaps even thousands of people for a donation before receiving a gift. However, through their authenticity and personal connection, your supporters are likely to generate a donation by asking a just handful of their contacts for their support. P2P fundraising has existed in various forms for years. Did you know the Girl Scouts were selling cookies to support troop activities in the early 1900s? Though providing something in return, the Girl Scouts understood that their girls were their best advocates and could make the biggest impact on fundraising through P2P methods. Around 1970, CROP Hunger Walks organized by Church World Services, and WalkAmerica, the predecessor to the March of Dimes’ March for Babies really got things rolling for fundraising walks. Since then, other popular events have emerged centered mostly around walks, runs, and cycling events. From the Pan Mass Challenge benefiting the Jimmy Fund at the Dana Farber Cancer Institute, to the American Heart Association’s Heart Walk, to the Leukemia and Lymphoma Society’s Team in Training, many larger nonprofits turned to P2P fundraising to generate a significant amount of revenue. When online P2P fundraising was introduced in the late 1990s, popularity and revenue generated through these campaigns exploded. Today, with advanced social media tools and an increasingly peer-enabled world we live in, P2P fundraising is more important than ever! And it is not limited to larger organizations – organizations of all sizes and missions can get in on this lucrative fundraising venture! 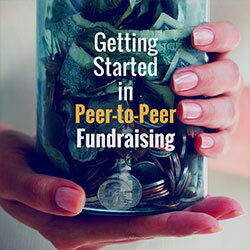 What Types of Peer-to-Peer Fundraising Are There? 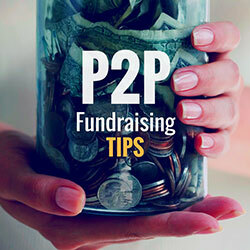 Though there are many different types of P2P Fundraising that exist today, below are the four most common types of campaigns for your nonprofit to consider. These events are developed and executed by the organization, and are likely the ones you are more familiar with. Though these events tend to be runs, walks, or rides, like the aforementioned examples, you will also find other types of events such as bowling tournaments, dance marathons, and even jump rope events. These events are also touted as a way to spread awareness about the organization and the cause. As they tend to take place at yearly intervals, proprietary events can foster loyalty to the organization. Third party events take advantage of existing events, typically athletic or endurance types of events, to engage fundraisers. For example, nearly 175 different non-profits have participants run and raise money through the Chicago Marathon. The obvious advantage of this type of P2P fundraising is that the organization doesn’t have to put on the event itself. The disadvantage can sometimes be that the connection with the organization is not as strong, as runners may sign up with a non-profit to gain entry into the event. More work is needed to form a connection with the cause and the organization. This type or P2P fundraising in facilitated by the nonprofit, while the actual planning of the personal campaign is handled by the fundraiser. For example, charity:water encourages their supporters to set up a fundraising page for their birthdays and ask for donations in lieu of gifts. This type of fundraising also includes memorial and tribute pages, dare campaigns (I’ll shave my head if you help me raise money), or events such as bake sales, athletic endeavors, or parties. This type of fundraising is limited only by your organization’s willingness to cede control and the creativity of your supporters. This type of fundraising is gaining in popularity in other types of business and is very similar to crowdfunding. Crowdfunding is the practice of financing a particular project by raising small amounts of money from a large number of people. Movie producers crowdfund the making of their movies, entrepreneurs crowdfund business ventures, newlyweds crowdfund honeymoons. This is the next generation of P2P fundraising! This type of fundraising has been limited to major donors in the past. For example, when financing the construction of a new building, large donors are sought out for naming opportunities and sponsorships. In this model, P2P fundraisers are recruited to help raise a certain amount of money for a particular project in a certain amount of time. Like do-it-yourself, there is no event for the organization to produce, and it has the benefit of allowing supporters and donors to be very involved and excited about financing a project. This could apply to funding a certain type of research, feeding a certain amount of people during the holidays, providing shelter to fire victims, and so much more! Is Peer-to-Peer Fundraising Right for Us? Though exciting, P2P fundraising is not a fit for every organization for a variety of reasons. Before you get started it is wise to do a self-assessment and some evaluation. Every nonprofit is looking for the silver bullet of fundraising, but we all know there usually isn’t one. Like anything else, raising money takes time, effort, and budget. Before starting off, ask yourself these questions. Do we have staff available to dedicate to these efforts? There should generally be someone or a team who is ultimately accountable for generating revenue through this campaign. This is typically a fundraiser, not a member of the marketing or IT team, though those functional areas will also be critical to setting up the campaign. If your organization is smaller, is everyone’s plate already overflowing? Do we have budget to invest in a new campaign? There is a lot more involved than just setting up a website and letting your supporters go to it. Costs for marketing, event costs, and supporter resources are just a few things to consider. Looking around the industry and your own organizational niche can shed some important light on what the market will bear when it comes to introducing a new campaign. Take a look inside: Does your organization already have a P2P campaign? Have you ever tried one before? If so, how did it go? The past is not always the best predictor of the future, but it can provide hints on what went well and what did not, providing you with ammunition to improve upon existing or prior campaigns. What is working in the industry: As you evaluate different types of P2P campaign, talk to others who have been involved in managing these campaigns. What are the primary pros and cons from their point of view? What would they do differently? Observe their campaigns online and in-person and look for insights that can help you. Remember, there is no better form of flattery than “borrowing” techniques that are working well for others! What is working in your local area or with your direct competitors: Can your immediate market sustain a new fundraising effort? Are there other programs like yours that already exist? If so, what spin could you put on a new campaign that will set it apart from the competition? Internal and external expectations can go in several different directions, but here are the two most common, but very opposite, possibilities. No buy-in: You are very excited by the prospect of starting a P2P campaign, but you are having difficulty finding any other champions within your organization. Starting a new campaign of this magnitude takes commitment throughout the entire organization. Continue to build your case until you have solid buy-in, particularly from senior management. Unrealistic expectations: Your board chair saw the success of the Ice Bucket Challenge or some other P2P campaign and believes that you too can bring in a windfall with very little effort or investment. This kind of attitude is setting you up for failure. As noted above, adequate resources and staff time must be dedicated to a campaign like this – and not just at the beginning. An ongoing commitment and the realization that most “overnight successes” are actually years in the making. Peer-to-peer fundraising is one of the most rewarding experiences for both participants and staff alike. If you’ve done your homework and are ready to take the plunge, you will not regret your decision! To see how your existing event stacks up against similar P2P campaigns, or to see what may be possible for a new one, be sure to check out the recently released Peer-to-Peer Benchmark Study from Blackbaud! How Effective Is Your Board Fundraising Committee? Corporate Sponsorships Are Not About Doing Good - Or Are They? Shana Masterson has been a fundraiser since 2001. In 2014, she joined Blackbaud as a senior consultant. Her unique skill set as both a peer to peer fundraiser and a technologist allows her to focus on maximizing peer to peer campaign revenue through success planning, road mapping, communication calendaring, configuration recommendations and more. Prior to joining Blackbaud, Shana led the American Diabetes Association’s online fundraising and communication strategy for the national special events team. She also worked for the National Brain Tumor Society, the American Cancer Society and the Muscular Dystrophy Association. Connect with Shana on Twitter or Linkedin.